In New York City’s west village, you’ll find a wonderful bakery called Amy’s Bread. Every so often (read: twice a week), I would pop in for their delicious Irish soda bread. I used to slather them in butter, and settle in to people-watch at the counter window. What I liked about Amy’s, was that they offered their soda bread in 2 different sizes; 1 big loaf (for all of you traditionalists) or personal-sized ‘buns.’ I liked the smaller ones because they were great for dunking in coffee. Besides, 1 big loaf was just too big for little old me and the thought of wasting it drove me nuts. *See tip below. This recipe is adapted from Ina Garten and I make it every year for St. Patrick’s Day. 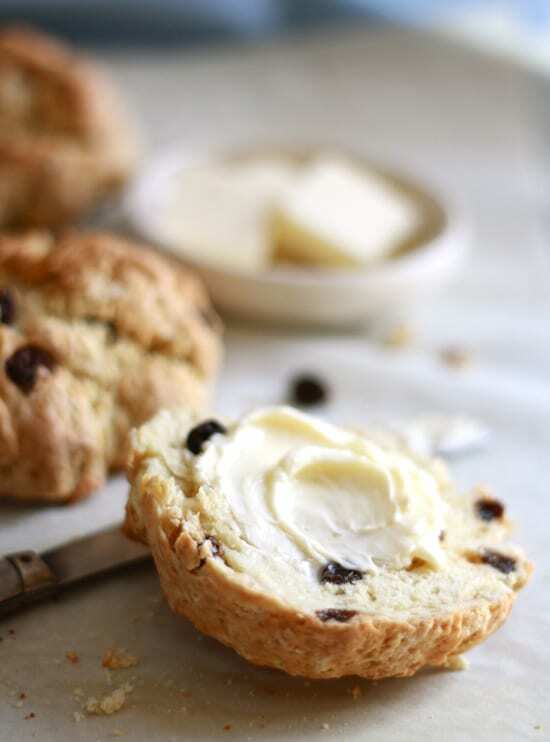 It’s made with tangy buttermilk and studded with plump, juicy raisins. The texture is wonderfully moist. Ina makes hers into 1 large loaf, but I shape mine into buns so that everyone can have their own. Who doesn’t love a personal-sized portion? Without fail, someone always asks for the recipe. *Have leftover soda bread? Don’t throw it away- turn them into biscotti! Layer thin slices of soda bread onto a parchment lined cookie sheet. Bake at 325 F for 15-20 minutes or until crisp. 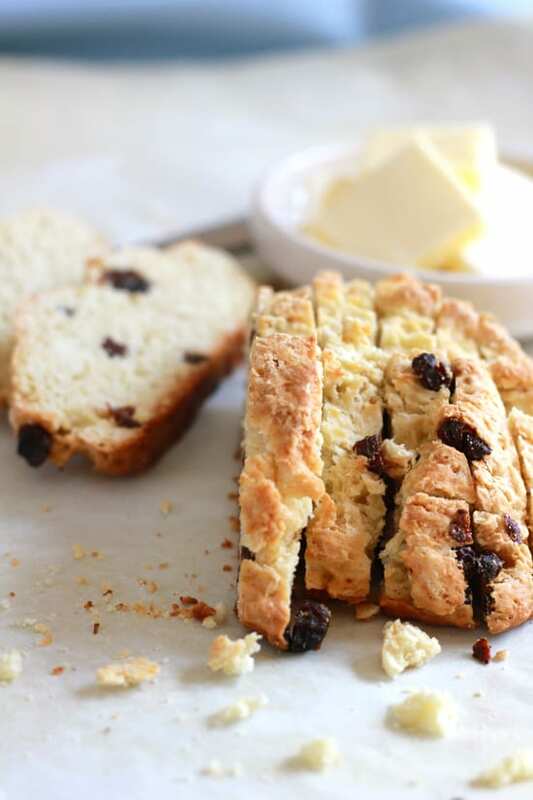 * Irish soda bread tastes best on the day that it is baked. With a fork, lightly beat the buttermilk, egg, and orange zest (if using) together in a measuring cup. With the mixer on low speed, slowly add the buttermilk mixture to the flour mixture. Combine the raisins (or currants) with 1 tablespoon of flour and mix into the dough. It will be very wet. Dump the dough onto a well-floured board and knead it a few times into a round loaf. Lightly flour a large knife, and cut the dough into 8 equal pieces. Shape each one into a ball and place onto the prepared sheet pan. With a serrated knife, cut an X into the top of each one. Bake for 20 to 30 minutes, until a cake tester comes out clean. When you tap on the bottom of the bread, it should have a hollow sound. *Have leftover soda bread? Don't throw it away- turn them into biscotti! 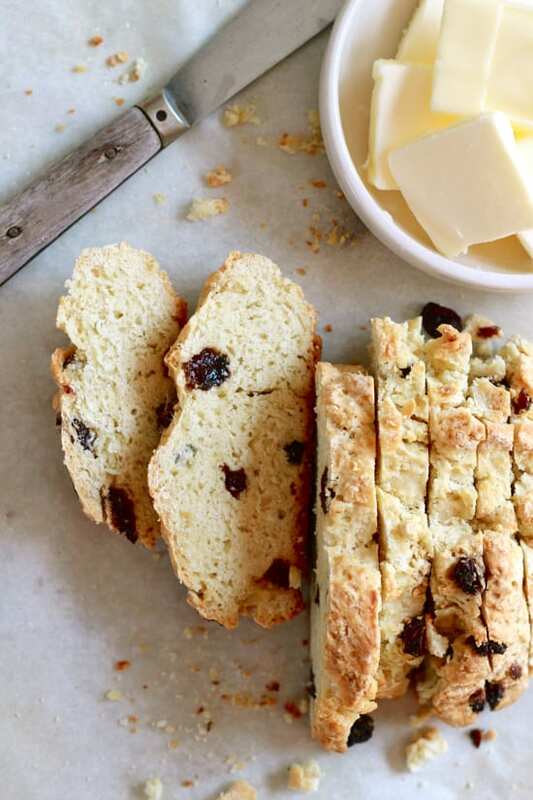 Layer thin slices of soda bread onto a parchment lined cookie sheet. Bake at 325 F for 15-20 minutes or until crisp. Such a great idea! I make Ina’s Irish Soda Bread every year too, and never thought to make individual loaves. Keeps it from drying out after you cut it, too! I’m totally doing this for St. Patty’s day this year. Hi there! Don’t you just love Ina’s recipe? I think I love everything she does… I’m a fan of the smaller loaves too for that very same reason- but if you end up with day old bread, turn them into biscotti (instructions at end of post)!! Thanks for stopping by! Individual Irish soda breads! Yes, please. :) My go-to recipe is adapted from Ina Garten, too. Except I accidentally added twice the butter and the result was so delicious I never went back. I love Irish soda bread everything. 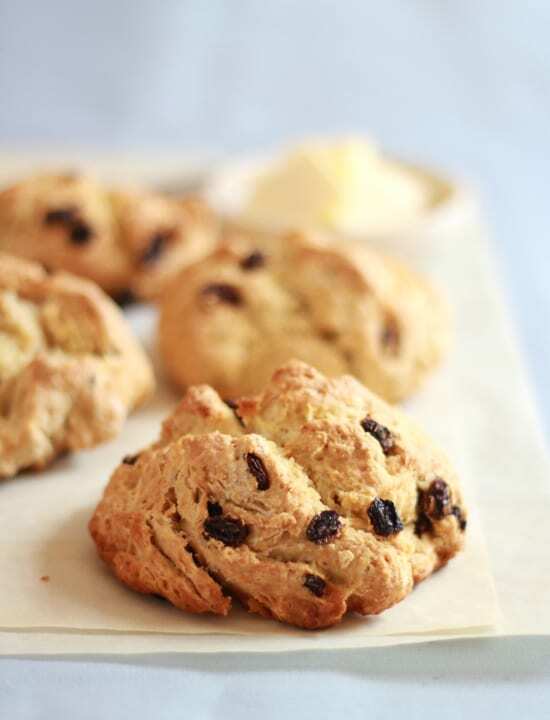 A local bakery has Irish soda bread scones that are simply amazing! Yes I agree- the dough is definitely very wet! But don’t worry, this is how it’s supposed to be. If it’s not wet, the end product will be dry & dense. Here’s what I do: Before kneading, I make sure that my board is well floured. Sometimes it helps to sprinkle a little extra flour on top of the dough as well (no too much). At this point, I am able to give it a quick knead without it sticking all over the place. I knead the dough for a very short amount of time just to bring it together. You do not want to over knead! Then I cut the dough into 8 pieces to make individual portions. This bread looks perfect! I’m definitely making it!! What a delicious bread – the love of soda bread is in my Irish genes!! I am heading to NYC in a few weeks, will be seeking out Amy’s Bread!! !